The State Opera was originally established in 1959 as a professional musical theatre company affiliated to the Jozef Gregor Tajovský Theatre and was intended to function as a touring theatre company. Since 1972 it has had the status of an opera company. The first performance of the newest opera theatre in Slovakia was J B Foerster’s opera Eva, directed by the first head of the company, František Rell, and conducted by Jozef Kende. The strongest personalities in the founding generation of singers and the pillars of the company for many years were the soloists Dagmar Rohová, Štefan Babjak, Jozef Konder, Milan Schenko, Andrej Bystran and Ladislav Longauer, who were gradually joined by František Caban, Ján Zemko, Jozef Hadraba, Božena Fresserová, Jarmila Vašicová, Božena Lenhardová, Mária Murgašová, Tatiana Brummerová, Alena Dvorská-Hodálová, Olga Hromadová, Mária Tomanová and others. The famous Slovak sopranos Edita Gruberová and Lubica Orgonášová began their careers in Banská Bystrica. From the beginning the theatre’s repertoire included operettas, musicals and ballets, but its main activity was the presentation of operatic works. Alongside established opera titles the dramaturgy of Slovakia’s smallest opera house was and remains oriented towards the performance of less well-known titles. Many of them have been Slovak premieres – Gounod’s Romeo and Juliet, Verdi’s early works Arolda and Atilla, Puccini’s Edgar and La Rondine, Donizetti’s La Favorite, Bellini’s I Puritani and I Capuleti e i Montecchi, Leoncavallo’s Gli Zingari, Mascagni’s L’amico Fritz, Donizett´s Linda di Chamounix and Maria Stuarda. The stage in Banská Bystrica hosted not only overlooked works but also directors who were unable to break into the closed environment of the SND opera in the 1990s – Marián Chudovský and in particular Martin Bendik, who worked in a team with the outstanding scenographer Aleš Votava. 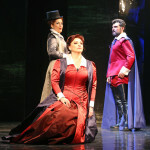 A combination of inventive dramaturgy under the leadership of Branislav Kriška, the modern theatrical sensitivity of the producers and a fortunate combination of soloists (Mária Tomanová, Gurgen Ovsepjan, Sergej Tolstov and others) helped the Banská Bystrica Opera keep the position of the most interesting and most ambitious opera company in Slovakia in the 1990s. At a time when the leading Slovak stage focussed on a safe, crowd-pleasing repertoire, Banská Bystrica provided space for original Slovak works – Beneš’s Petrified, Cikker’s Mister Scrooge, Zeljenka’s Countess Bathory. 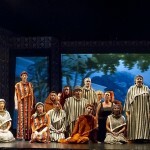 The most recognised act of the theatre, as well as a particularly important event in Slovak opera life, was the staging of the original version of Krútňava (The Whirlpool) within The Year of Eugen Suchoň (2008). The ensemble under the direction of an acknowledged play director Roman Polák and the principal conductor Marián Vach prepared it in the way as it was presented only once during its world opening in the Slovak National Theatre in December 1949. Its further staging was roughly influenced by censorship of the Communist regime which struck the moral message of the work. The rehabilitating re-staging of the Slovak National Opera Ensemble was prepared by the composer Vladimír Bokes. 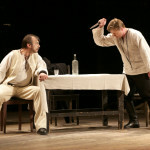 Three years later, again on the occasion of the hundredth anniversary of the birth of composer, the State Opera held the Slovak premiere of Ján Cikker’s Coriolanus. Banská Bystrica State Opera was until 2014 the chief organiser of the opera programme of the Zvolen Castle Plays festival, a unique open-air opera festival in Slovakia. 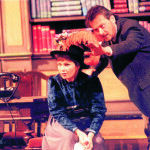 During its 30-year history its artistic director was the well-known Slovak theatreologist and historian Jaroslav Blaho. Since 1979, every year at the end of June and the beginning of July, operas from the company’s core repertoire have been performed in the courtyard of the Slovak National Gallery at Zvolen Castle. The performances include special foreign guests. During the socialist era these were excellent artists of the Eastern Bloc and soloists whose names shone on the posters of the Verona Arena – Olivia Stapp, Alessandro Verduci, Mario Malagnini, Gabrielle Floresta and Paolo Gavanelli. In the 1990s, the festival underwent a crisis as a result of a lack of financing that made it impossible to maintain the standards that had been set in the invited guests. The last decade meant for the festival a period of artistic stability with a well thought-out dramaturgy and a systematic focus on guests of Italian and Spanish provenance. A series of concert performances of works by the young Verdi as yet unheard in Slovakia (La battaglia di Legnano, Alzira, I Lombardi, I masnadieri) featuring outstanding international performers (Alberto Cupido, Francesca Scaini, Roberto Servile, Susanna Branchini, Dimitra Theodossiou, Riccardo Zanellato, Ignacio Encinas, Chiara Taigi) proved to be one of the greatest of Slovak opera seasons. In 2015 the open-air opera was moved to Banská Bystrica. The new festival Operalia Banská Bystrica follows the tradition of Zvolen Castle Plays.